Seven days after a sluggish first half cost the squad dearly against Wittenburg, the Wabash passing game struck DePauw early and often Saturday, as the Little Giants raced to a 21-0 first-quarter lead and never looked back in winning the 120th Monon Bell Game, 38-21. Pass it the Little Giants did, as sophomore quarterback Michael Putko connected on 11 of 14 attempts in the opening half for 191 yards and three touchdowns. He finished the contest with 21 completions in 29 attempts for 296 yards and those three TDs. “It was important to get on them and get a lead so we could get comfortable with things,” Putko said. 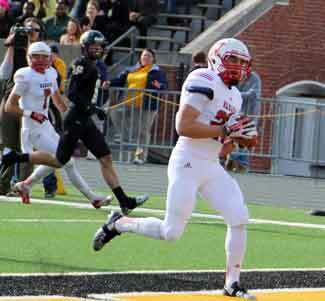 That trust was rewarded with a number of big plays, each exploiting DePauw’s aggressive defensive tendencies. The first, a 64-yard strike to Laird with 5:01 to go in the first quarter, came on a simple wheel route run behind a bubble screen set up as a decoy. If the safety goes for the decoy, the ball goes outside to Laird. If the defender doesn’t, the quarterback throws it to the other receiver. The second, a 26-yard pass to Hildebrand with 52 ticks remaining in the opening period, came after the Little Giants used the same bubble screen with success earlier in the drive. This time, Putko would pump fake another bubble-screen throw sensing the advantage and try to sneak Hildebrand behind the defense. It, too, worked without a hitch. Raeburn couldn’t have asked for things to go more smoothly. 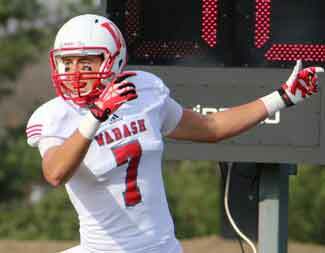 The strong aerial start by the Little Giants dealt a crushing blow to the in-state rivals. “It hit them hard,” Laird said. “We rely on the run game here. We have great receivers who block very well, but we can also catch the ball. It seemed like we scored on just about every series in the first half. It set the tone early and that’s how you win ball games. That early effort put a nice cap on the regular season and sent the second straight Wabash senior class into history with a spotless 4-0 record vs. DePauw.